While many of us are on the workout/running train constantly and never seem to get bored with the task…. Please know that everyone is in a different place and there are plenty of people who are currently struggling to get out there and do it again. Yes Hollie, this post is for you. I know there are some people who are super awesome and can run every day, like Shelly HERE. However, it’s not something that my body or mind can handle. My hat is off to all of you daily runners. I personally only run 3 or 4 days a week. My time and family obligations do limit my running but my body also creates its own limits because I can’t take the daily pounding. When I run, I tend to run a longer distance to “make up” for the days I can’t run. In order to avoid burnout, it is good to change up your routine. Here are a few things you might try in order to keep the workouts/runs fresh and fun. RACE!! If I keep a race on my calendar every so often, it keeps me focused and in the game. Go for a swim Triathlon anyone? If you have access to a gym, try a class: kickboxing, spinning, yoga, pilates, or strength training. Better yet, try ALL of the classes at your gym, make it a challenge to try a new class each week. No gym? Get some new fitness DVDs for your TV. Tae Bo, Jillian Michael’s 30 Day Shred, Bob Harper’s Yoga (See RunWithJess’ Yoga Challenge), Belly Dancing, Hip Hop Abs, P90X. No TV? Get a few weights or resistance bands for the house and follow the billion various strength workouts in the fitness magazines. Do push-ups, squats, stretching, jumping jacks, sit-ups. The key to being healthy is moving. That doesn’t mean that you have to run every day or run high mileage, do what is enjoyable to you. If you feel as if you are burnt out on running, I am reluctant to say stop running but that is certainly a decision you have to make for yourself. If you stop running, even for a couple weeks, know that you will lose fitness and have to rebuild. It happens to all of us, we refocus and rebuild all the time for various reasons. However, if you are already struggling a bit with motivation or why you run, starting at the bottom again to totally rebuild your fitness may cause more questions and/or depression. So if you decide to stop running for a bit, focus on other fitness activities to keep you strong and fit. Keep your chin up, reduce running to a fewer number of days per week, and add in a few new things to keep it fun and fresh. You will be happy and running faster and stronger before you know it. Everyone goes thru spells of frustration and fatigue, this is totally normal. Relax, breathe and refocus. As a side note, many people are getting burnt out due to improper fueling. If you are tired all the time, then it may not just be about your running but how you spend the first hour after your run. I use a Post Workout Recovery Drink after my runs and this helps refuel my muscles and reduces fatigue. Think about what you do AFTER the run and consider that it may be affecting your NEXT run. Hydration and fueling is a real issue as to why many people are frustrated fatigued on a constant basis. You don’t have to do what I do, just do something to help yourself get to the next workout as recovered and fresh as possible. 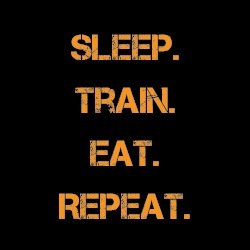 What is your favorite type of cross training? How many days a week do you run? Any other ideas as to how to keep the fitness routine fresh & fun? This entry was posted in AdvoCare, Running and tagged AdvoCare, AdvoCare Post Workout Recovery Drink, cross training, Fitness, Keeping the Fitness Routine Fresh & Fun, One Foot In Front of the Other Blog, Run with Jess, Running, Running Burnout by tootallfritz. Bookmark the permalink. I always dread going to the pool but am happy after I finish. Swimming isn’t exciting, it’s not hard, it’s just moving the body. I also think the coolness of the water helps with sore muscles. I always have fuel in my car for the ride home. You need to ingest something, ideally “something” with a 4:1 carb to protein ratio within one hour of intense exercise. I try to keep fitness fresh/fun by getting outdoors and “playing”, having fun and being a kid again. That’s how I feel when I run new trails. It’s an adventure! There are so many ways to make fitness “fun.” I am always encouraging people to find a way to workout that doesn’t feel like “work.” One of my sisters-in-law says she hates “fitness,” but she loves yoga and dance, so that’s how she stays active. One of my friends plays ultimate frisbee. I used to play in a recreational soccer league. If you can find something that you enjoy, then it’s much easier to stay motivated. If you don’t like running, you don’t have to. You can bike, swim, rollerblade, dance, do yoga, pilates, play a team sport, do martial arts, whatever! No sense forcing yourself to do something that you don’t enjoy. Also, I like the idea of trying different group exercise classes. Oftentimes, the only way I make it to the gym is for a group class (usually Pilates or a weights class, since I don’t exactly know what I’m doing when it comes to strength work). But it keeps me going! Thanks Amanda for this post! 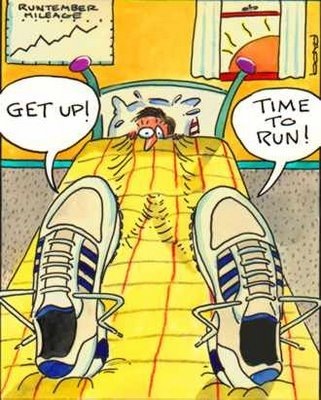 I am planning on running Tuesday, Wednesday, Thursday and Saturday, with the long run on Saturday…then I am going to do gym workouts on 1-2 other days! I also do not ever refuel. Perhaps I should start that too! I tear those “exercise” pages out of my magazines. I keep saying I’m going to put them into a binder so I can develop a routine. Note to self: Buy another binder. The binder idea is a great one. I sometimes laminate the ones I like but mostly, I just end up throwing them out. I like the binder idea a lot! I don’t use many recipies. I like to make my own stuff but that is a great idea for recipies too (and the fitness workouts from the mags).